Laser bio-stimulation is a well-established procedure in Medical Acupuncture. Nevertheless there is still a confusion as to whether it works or the effect is just placebo. Although a plethora of scientific papers published, showing positive clinical results, there is still a lack of objective scientific proofs about the bio-stimulation effect of lasers used in Acupuncture. The objective of this work was to design and build a body surface electrode and an amplifier for biopotential recording from acupuncture points, considered here as small localized bio-sources (SLB). The design is aimed for studying SLB potentials provoked by laser stimulus, in search for objective proofs of the bio-stimulation effect of lasers used in Medical Acupuncture. The active electrode presented features a new adjustable anchoring system and fractionation of the biopotential amplifier between the electrode and the cabinet's location. The new adjustable electrode anchoring system is designed to reduce the electrode-skin contact impedance, its variation and motion artifacts. That is achieved by increasing the electrode-skin tension and decreasing its relative movement. Additionally the sensing element provides local constant skin stretching thus eliminating the contribution of the skin potential artifact. The electrode is attached to the skin by a double-sided adhesive pad, where the sensing element is a stainless steel, 4 mm in diameter. 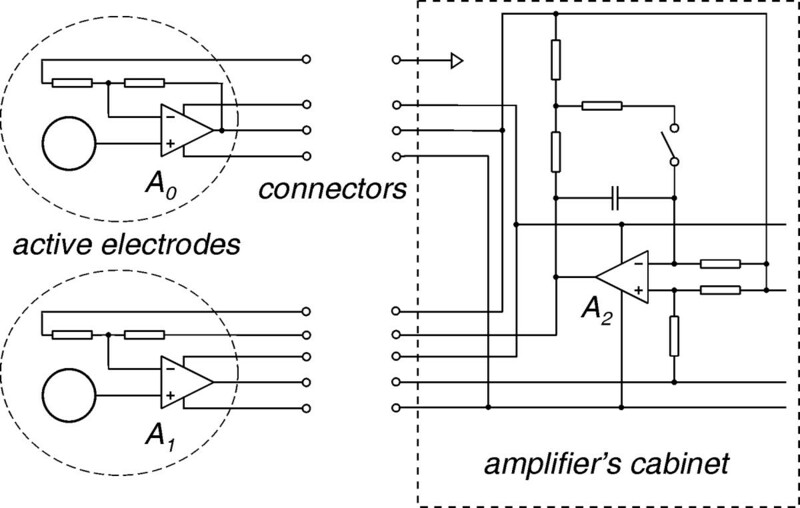 The fractionation of the biopotential amplifier is done by incorporating the amplifier's front-end op-amps at the electrodes, thus avoiding the use of extra buffers. The biopotential amplifier features two selectable modes of operation: semi-AC-mode with a -3 dB bandwidth of 0.32–1000 Hz and AC-mode with a bandwidth of 0.16–1000 Hz. The average measured DC electrode-skin contact impedance of the proposed electrode was 450 kΩ, with electrode tension of 0.3 kg/cm2 on an unprepared skin of the inner forearm. The peak-to-peak noise voltage measured at the amplifier output, with input terminals connected to common, was 10 mVp-p, or 2 μVp-p referred to the input. The common-mode rejection ratio of the amplifier was 96 dB at 50 Hz, measured with imbalanced electrodes' impedances. The prototype was also tested practically and sample records were obtained after a low intensity SLB laser stimulation. All measurements showed almost a complete absence of 50 Hz interference, although no electrolyte gel or skin preparation was applied. The results showed that the new active electrode presented significantly reduced the electrode-skin impedance, its variation and motion artifact influences. This allowed SLB signals with relatively high quality to be recorded without skin preparation. The design offers low noise and major reduction in parts, size and power consumption. The active electrode specifications were found to be better or at least comparable to those of other existing designs. The non-invasive nature of laser bio-stimulation have made lasers an attractive alternative in Medical Acupuncture at the last 25 years. Unfortunately there is still a confusion as to whether they work or their effect is just placebo. Although a plethora of scientific papers published, showing positive clinical results, there is still a lack of objective scientific proofs about the bio-stimulation effect of lasers used in Acupuncture. The objective of this work was to design and built a body surface electrode and an amplifier for biopotential recording from acupuncture points. The latter are considered here as small localized bio-sources (SLB). As discussed by other authors, SLB are small area body regions with specific electrical, physiological and anatomical properties (e.g. high density of gap junctions, relatively low impedance etc.) [1–4]. They appear to be highly sensitive to mechanical, thermal, electrical or electromagnetic stimulation and are found to take place from the epidermis (stratum granulosum) to a maximum depth of 2 cm [5–8]. The active electrode is aimed for studying SLB potentials provoked by laser stimulus, in search for objective proofs of the bio-stimulation effect of lasers used in Medical Acupuncture. Electrokinetic effect – the disturbance of the double layer of charge at the electrode-skin interface causes variations of the DC polarization potential . Skin potential or skin stretch artifact – stretching of the skin causes a change of the potential of the barrier layer between the epidermis and the dermis . Variation in the electrode-skin contact resistance – caused by the amplifier input bias current and the current flowing due to the polarization potential. Equivalent electrical model of the electrode-skin interface. where ΔVskin is the skin stretch artifact and ib is the amplifier input bias current. It was deduced that in order to keep the resistive interfering component less than 10 μV when DC coupling is employed and with both currents contributing equally to it, then ib<50 pA and Ri>1 GΩ . If an AC coupling is used then the resistive component of the motion artifact is eliminated. For dry electrodes the motion artifacts are mainly caused by changes of the polarization potential and the contact impedance due to the poor electrolyte layer at the electrode-skin interface. Therefore a firm electrode-skin contact is of primary importance. Thus a new adjustable electrode anchoring system was designed for the purpose, as shown in Fig. 2. Turning the electrode cap clockwise pushes the sensing element against the skin. Thus electrode-skin pressure is increased, leading to reduction of the contact impedance and its variation. The electrode-skin relative movement is also reduced, making the noise contribution of the electrokinetic effect insignificant. Additionally, the sensing element provides constant skin stretching that lowers the contribution of the skin potential artifact. 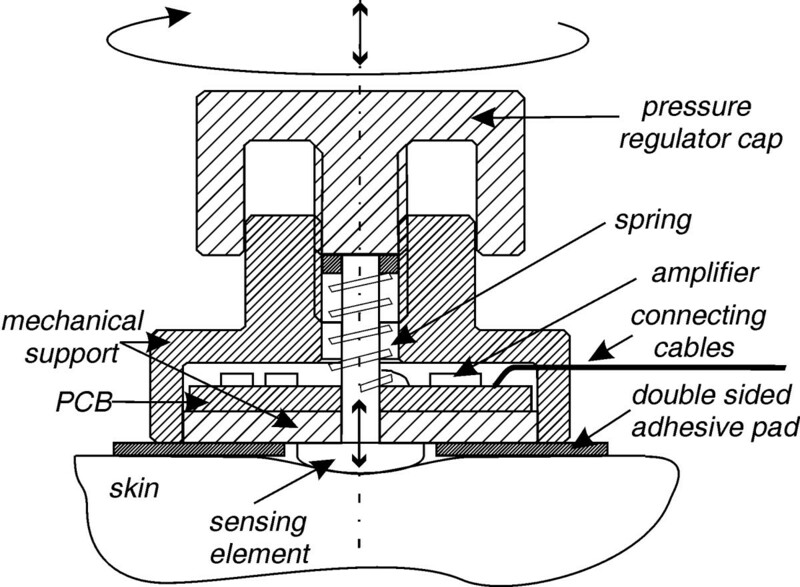 Turning the electrode cap counter-clockwise, releases the spring, which pushes back the sensing element, resulting in a lower electrode-skin pressure. Titanium, stainless steel and aluminum were considered as electrode sensing materials. Stainless steel was chosen because it is more commonly available than titanium and preferable to aluminum, which has been shown to have problems due to chemical response of its oxide to perspiration . The use of stainless steel electrode material ensures low noise, minimal offset potentials and excellent DC stability suitable for low-drift DC measurements . The sensing element is a 4 mm diameter, selected according to the average SLB size. Although the obtained contact impedances with the prototype electrode were relatively low for dry electrodes of that size, impedance matching at the electrode site was still needed to cope with the power-line cable interference. Dry active electrode with adjustable anchoring system. Schematic of the biopotential amplifier with active DC rejection/suppression. Simplified schematic of the biopotential amplifier with active electrodes. Schematic of the basic two-op-amp instrumentation amplifier. , τ0 and τ1 are the respective DM open loop gains, and the time constants of the first poles of op-amps A0 and A1 (assumed to be internally compensated), and Ac1(s) is the CM gain of op-amp A1. It should be noted that the CM gain of op-amp A0 is omitted from (4) and (5), since its influence on both gains is insignificant. where GBPA0 is the gain bandwidth product of op-am A0. Trimming R2 is a good solution for achieving an ultra high CMRR for demanding application, however it is not practical since the trimmer has to be incorporated in the electrode. Alternatively, ZE or R3 can be trimmed, which however will alter also the amplifier DM gain. Considering equation (12) it can be shown that for application with relatively high DM gain and proper op-amp selection, both trimming and compensation (C1) can be omitted, without significantly degrading the CMRR. For example, if the usual 1% tolerance resistors are used and op-amps with CMRR of 100 dB and DM open loop gain of 120 dB at 50 Hz, then for an amplifier with DM gain of 5000, a CMRR of 96 dB can be achieved without trimming. where τi = RiCi is the time constant of the integrator, and τ2 are the respectively the DM open loop gain and the time constant of the first pole of op-amp A2. Whenever Ri>>R5 then k ≈ (R6/R5+1), which is true with the time constants and voltage gains, typical in biopotential recordings. For signals bellow the amplifier high-pass cut-off frequency, ZE(s) decreases due to the active DC rejection/suppression circuit. For DC signals equation (8) is maximally imbalanced and thus CMRRR(0) ≈ Ad(0). Since for biopotential amplifiers Ad(0) is much lower than CMRRA1(0) and Ad0(0), therefore CMRR(0) ≈ Ad(0), which represents the worst case. where 2k is approximately the DC gain of the stopped integrator (A2, Ri, Ci, Ri *, R5 *, R6 *) in semi-AC-mode. Thus DC signals meet lower gain, in order to prevent saturation from large electrode offsets or other high DC potentials. where RiA0 and RiA1 are the input resistances of op-amps A0 and A1. However, at higher frequencies, the electrodes' input impedances are much lower and about the same (assumed that A0 and A1 are of the same type), due to the op-amps' input and additional stray capacitance, being in parallel to the high op-amps' input resistance. where en0, en1 and en2 are the respective voltage noises of op-amps A0, A1 and A2. The circuits described by the transfer functions HAC(s) and HsAC(s) are stable because all the poles are situated in the left half of the complex s-plane and there are no resonance effects as the poles are on the real s-axis. 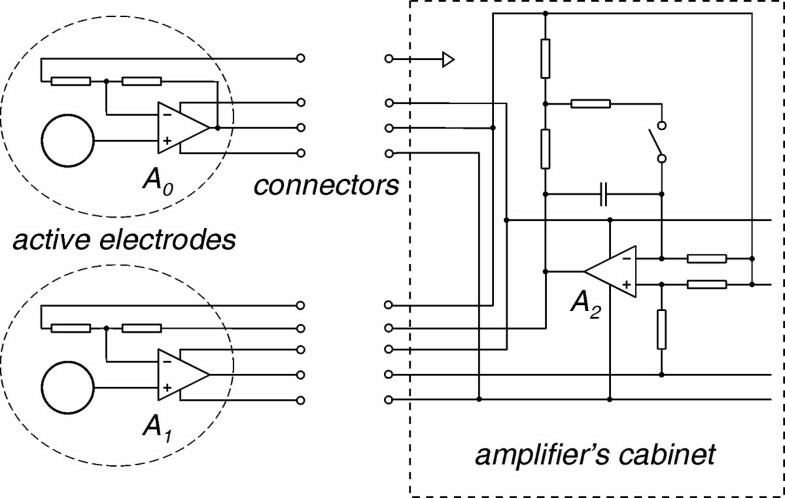 The schematic of a multichannel amplifier with active electrodes, built according to the design discussed is shown in Fig. 6. Each channel amplifies the signal between its input (E1...EN) and the reference input E0 (monopolar configuration). The output voltage of op-amp A2 is equal to the DC input voltage, multiplied by the ratio (R3 + R4)/R3 for both modes. The choice of the resistor ratio (R3 + R4)/R3 is a trade-off between DC input range and noise, since a low ratio enhances the noise contribution of op-amp A2. The ratio R4/R3 was chosen so that to allow a DC input voltage range of ± 370 mV, without saturating op-amp A2. 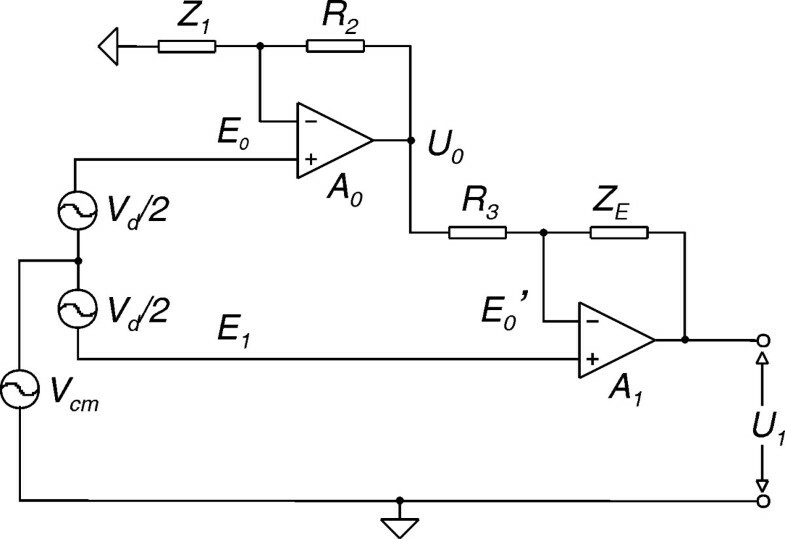 The offset voltage at the amplifier output (U1) is the input offset voltage of op-amp A2, times the resistor ratio (R5 + R6)/R5. In case of high DM gain, the output offset voltage would become unacceptably high. Thus, op-amp A2 was selected for its ultra-low offset voltage of 1 μV, low noise and high CM input range to prevent latch-up. Moreover A2 is a low input bias current type, which allows the use of high value input resistances without producing large offset voltages between its inputs. Op-amp A0, was selected with a relatively high GBP, in order to confine its influence on the CMRR at higher frequencies. Combining high DM gain, with high GBP op-amps, allowed Z1 to be implemented only with its active part R1, as thus the CMRR at 50 Hz was not significantly degraded. As shown in (23), the equivalent input noise is mainly determent by the noise of op-amps A0 and A1. They were implemented with the low-noise CMOS op-amp LMV751 in a SOT23-5 package. Multichannel biopotential amplifier with active electrodes and DRL circuit. 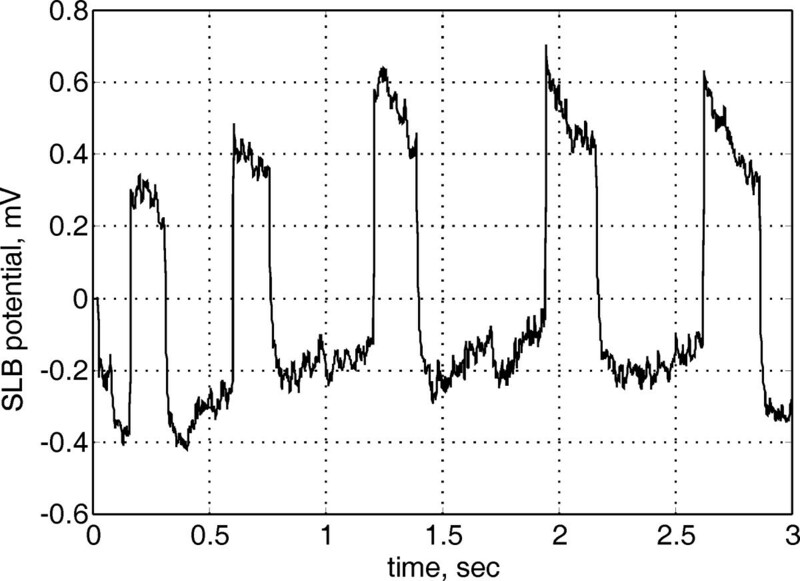 Because of the large integrator's time constant, the amplifier has a very slow response after overloads (≤ 10τi), caused by large signal disturbances. Thus a deblocking circuit was added at the cabinet's location, for temporary reduction of the time constant during overload . It is controlled by the output voltage U1 through the low pass filter (R13, C2). The filter output controls two threshold triggers (A3, A4), which through D1,D2 control the MOS transistor T1, acting like a switch. When the output signal reaches its range limits (defined by R14, R15, R16), T1 opens and the new reduced time constant τi* = (R7//R11)C2, pulls the output signal to the zero level. This state is maintained for additional hundred milliseconds (R13C2) and then is switched back to its original value. 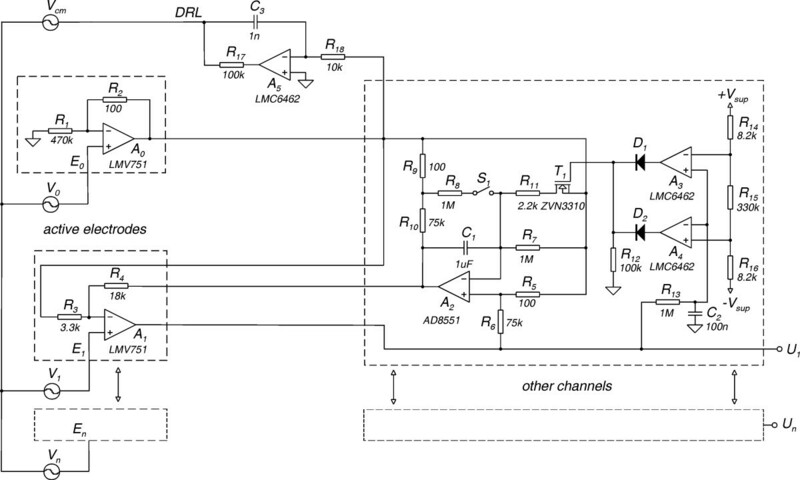 The connection between the amplifier common and the signal source is implemented by a driven right-leg (DRL) circuit. The CM voltage at the output of A0 is reduced by a factor equal to the DRL circuit gain (ADRL = 314 at 50 Hz), which theoretically should give a 50 dB extra CMRR at 50 Hz. In addition, in case of a faulty op-amp, the DRL circuit will limit the maximum patient current to a safe level of 50 μA. 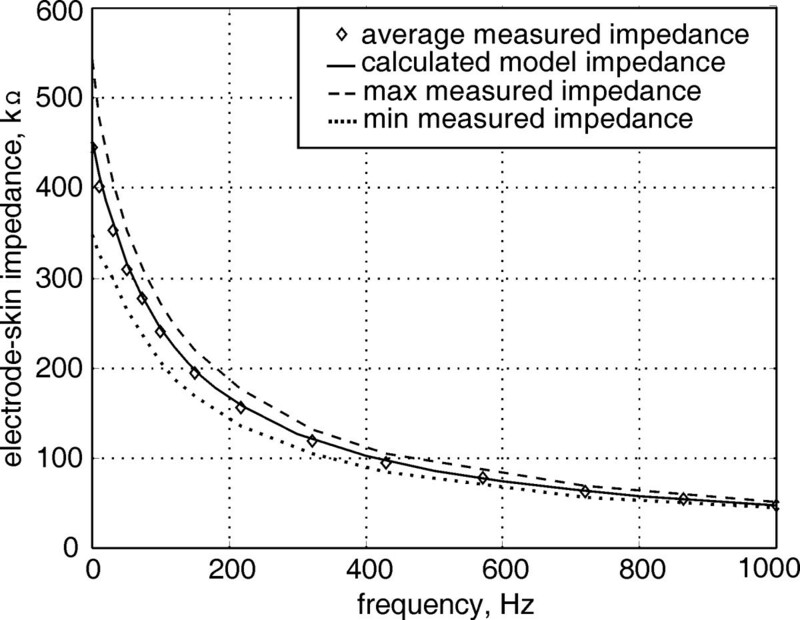 The contact impedance of the proposed electrode, measured and averaged over five subjects, and its calculated model impedance are shown in Fig. 7. The values of the model elements were determent to give the closest agreement between the measured electrode-skin impedance and that of the model. The values are: Rs = 300 Ω, Rd = 450 kΩ and Cd = 3 nF. The measuring technique is described by Bergey et al. and was performed five minutes after the application of the electrodes to allow their impedance to settle to a constant value . The electrodes were applied with moderate tension of 0.3 kg/cm2 on an unprepared skin of the inner forearm. The impedance was lower when higher tension was applied or when sweat was present on the skin. The applied current density was 0.01 mA/cm2 and no current density impedance dependence was observed . The electrode-skin impedance showed two-decade spread between different subjects, which was also reported in other works . 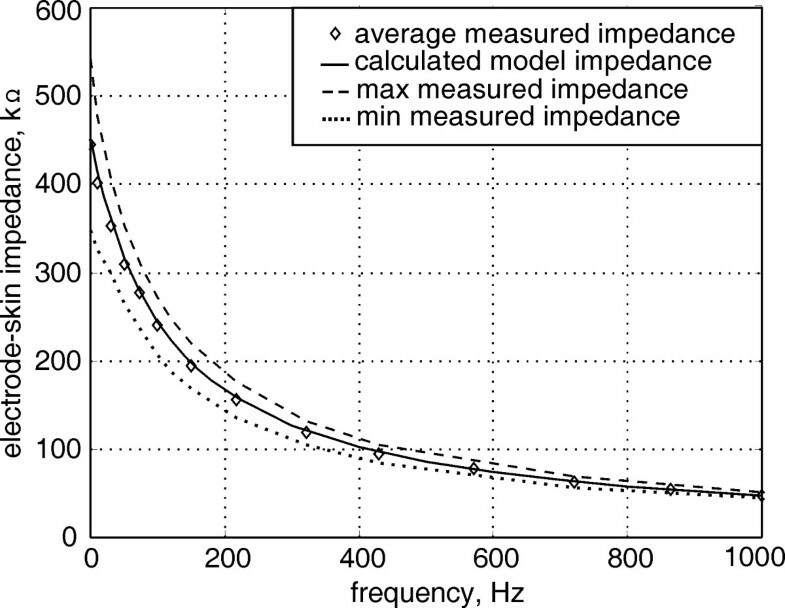 The average electrode-skin contact and the calculated model impedance against frequency. The plot shows also the minimum and the maximum data sets for five subjects. 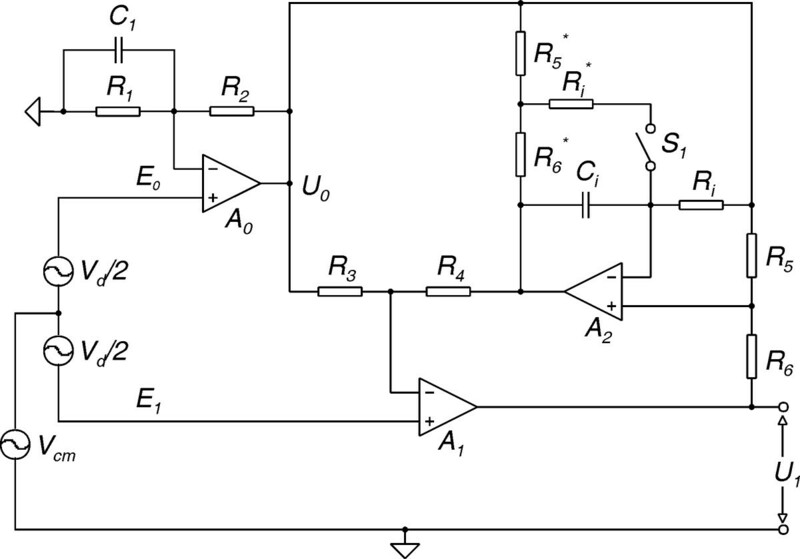 Simulations of the amplifier circuit were carried out using PSPICE. The op-amps used in the model were with gain-bandwidth product (GBP) of 5 MHz, DM open loop gain of 120 dB and CMRR of 100 dB. The integrator time constant and the resistor ratios of the feedback loop were: τi = RiCi = 1, R4/R3 = 6 and R6/R5 = 700. 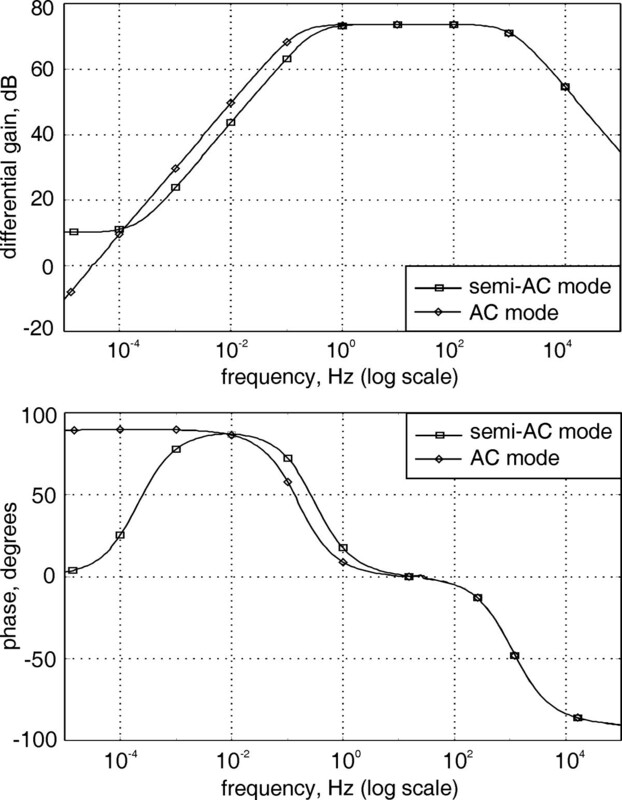 The amplifier frequency response plots, for both operating modes, are shown in Fig. 8. In semi-AC-mode the high-pass response is with 1st order pole at 0.32 Hz and zero at 0.2 mHz. In AC-mode the high-pass response is with 1st order pole at 0.16 Hz and zero at 0.16 μHz. The mid band DM gain is the same for both modes. Simulations were also carried out for the estimation of the power line interference due to induced displacement currents into the electrode leads. The increased stray capacitance between the power line and the amplifier, caused by the increased number of electrode leads, was taken into consideration in the simulation model. The results showed that the interference caused by the active electrode unshielded leads was insignificant. A plot of the amplifier frequency response. Table 1 shows the amplifier specifications, measured with battery powered prototype and test equipment. All the parameters were in close agreement with those of the simulations. The peak-to-peak noise voltage measured at the amplifier output, with input terminals connected to common, was 10 mVp-p, or 2 μVp-p when referred to the input. The CMRR of the amplifier was 96 dB at 50 Hz, measured with imbalanced electrode impedances (ΔZe = 47 kΩ). The maximum measured CMRR with DRL and a CM input signal of 4 Vp-p, was 126 dB at 50 Hz, where the output signal level was approximately equal to the amplifier output voltage noise. A sample record from the practical application of the active electrode, obtained after a low intensity SLB laser stimulation, is shown in Fig. 9. The amplifier was battery powered and optically isolated by linear optocouplers. The bandwidth was limited to 200 Hz, by 6th order low pass Bessel filter, and the signal was sampled with 1 kHz. The electrodes were connected with a high-density unshielded ribbon cable. One electrode (E1) was placed on SLB TH-23, near the eyebrow, where the reference (E0) was placed on the ear lobe. No electrolyte gel or skin preparation was applied. The measurements were performed in a typical laboratory room. All measurements showed almost complete absence of 50 Hz interference. The noise present in the signal is mainly compounded of artifacts from eye movements, electromyographic signals, and noise from the electrode-skin interface. Biopotential acquired in semi-AC-mode from SLB TH-23 after low intensity laser stimulation. The best solution for an active electrode would be to perform the entire analog signal processing at the electrode site. This could be achieved with a custom made integrated circuit, but the cost would be much higher. We found a good alternative in using SMD technology and integrating only the front-end of the amplifier into the electrode. The ultra high input resistance of the electrode is degraded at higher frequencies by the op-amp's input capacitance in parallel with the stray capacitance due to the electrode Printed Circuit Board (PCB). Nevertheless, combining an op-amp with low input capacitance and a proper PCB design, allowed a relatively high input impedance to be achieved at 50 Hz. That decreased the amplifier sensitivity to high electrode-skin impedance imbalances, by reducing the transformation of the CM interference signal into unwanted DM signal. 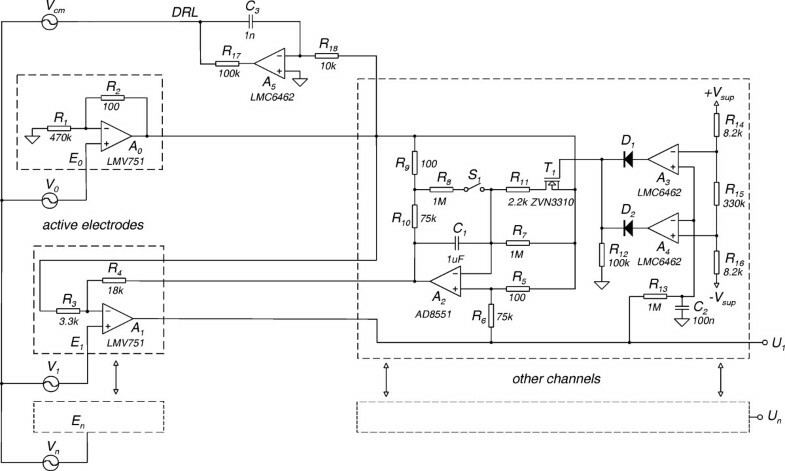 Unfortunately, most data sheets do not properly specify op-amp's input capacitance, neither DM nor CM. The active electrode presented is not suitable for applications requiring a low differential gain and large signal bandwidth due to the decreasing CMRR at higher frequencies, if not properly compensated. On the other hand, below the high-pass cut-off frequency, the CMRR is degraded by the active feedback circuit, and reaches its minimum value for DC signals, equal to the DM gain. The circuit can accept high value input filter resistances, which will also limit the patient auxiliary current in case of fault condition of op-amps A0 and A1. Because of the limited electrode space, it is preferable that the front-end op-amps feature internal electrostatic discharge protection circuitry, rather than building an external one. The new electrode anchoring system significantly reduced the electrode-skin impedance, its variation and motion artifact influences. The proposed amplifier fractionation resulted in lower noise and less parts. Moreover splitting the amplifier between the electrodes and the cabinet's location allowed the use of an automatic DC deblocking system and mode switching. The prototype tests showed that with the active electrode presented, SLB signals with relatively high quality could be recorded without skin preparation. The 50 Hz interference pickup by the electrode leads was practically eliminated. Because high electrode-skin impedances are tolerated, no electrolytic gel is needed. This allows fast application of the electrodes, minimizes patient discomfort and eliminates the risk of infection. With proper op-amps selection, the active electrode specifications were found to be better or at least comparable to those of other existing designs. The design offers low noise and major reduction in parts, size and power consumption. It is currently used in studying laser provoked SLB potentials and their propagation, aiming to gain a better insight into the bio-stimulation effect of lasers in Medical Acupuncture.